A coronal mass ejection (CME) hit Earth’s magnetic field during the early hours of October 2, sparking a geomagnetic storm. In North America, auroras spilled across the Canadian border into more than a dozen northern-tier US states, including Northern Ohio. The CME left the sun on Sept. 30, propelled by an erupting magnetic filament, racing away from the Sun at 2 million MPH. 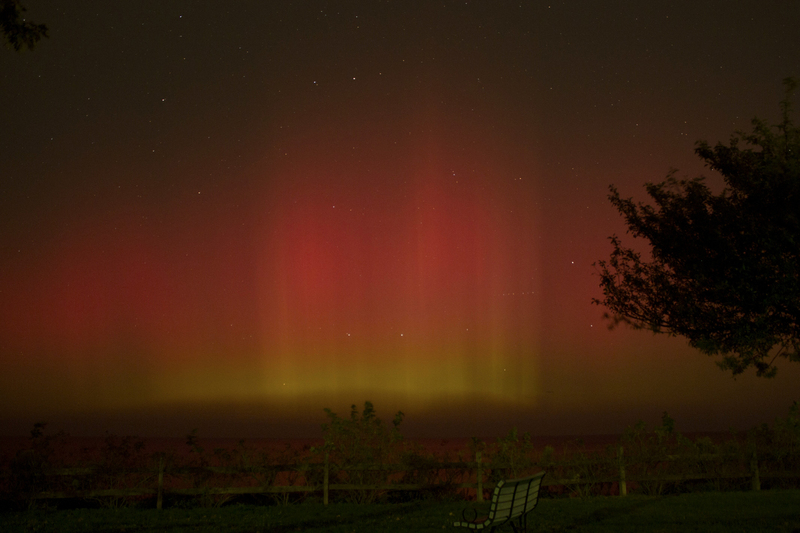 CAA members David Nuti and Christopher Christie observed the light show from Lake Erie’s southern shoreline and captured some images. Presented here is one we think is pretty spectacular! Photo Notes: Canon EOS Rebel T3: ISO 800, 12 sec., f/3.5, 18mm, 12:41 AM, October 2, 2013. This entry was posted in Uncategorized and tagged astrophoto, aurora, member photographs, northeast ohio, ohio, photograph. Bookmark the permalink.